Every bride used a starter yeast that was given to her by her mother or neighbor. From this she made her own, always reserving a bit of dough or keeping the scrapings of the dough tray to use as a starter for the next baking. Yes, this book has seen a lot of use. The cover of The Art of Pennsylvania Dutch Cooking has radishes, sugar-covered filled donuts, what look like cinnamon rolls, green beans with, I think, ham, and some sort of a corn stew. The author’s photo on the back has Edna Eby Heller wearing very familiar glasses: I remember them from the high school photos on the walls of my mom’s high school, from the year my mom graduated. This looks, in other words, to be a very good old-school Pennsylvania Dutch cookbook. Lots of good thick vegetable soups, cream of vegetable soups, pea soup, and so on. And recipes with amazing names like hog maw, scrapple, hex waffles, and snavely sticks. And also recipes with names like schmierkase, boova shenkel, kasha kucha, and gschmelzte nudle. Probably my favorite recipe in here is the cinnamon drop, which is very easy to make. It’s basically a very simple cake sprinkled with brown sugar and butter so that, when cooked, the middle “drops”, making a sweet, chewy, semi-crunchy cake. I’d like to try the rhubarb upside-down cake. It sounds like it’s going to be caramelized rhubarb with cake on top, like a pineapple upside-down cake but better! Unfortunately I can’t find rhubarb around here. I’m not sure I’ve ever seen it in stores; growing up in Michigan, it was always traded by housewives, who grew it around the house. I’m still looking forward to potato soup, peas and dumplings onion pie… and Montgomery pie, which is “a lemon-flavored molasses custard with a cake-like top”. I can’t say whether the recipes are authentic or not, but they are certainly good. 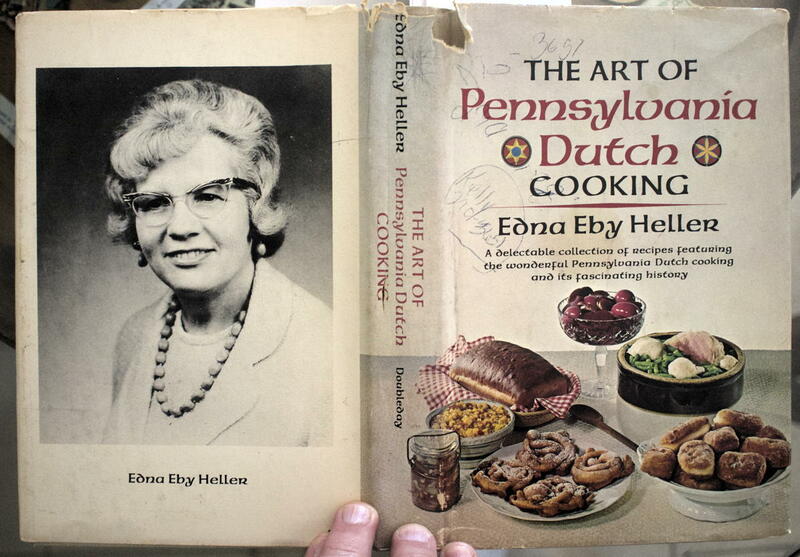 If you’re looking to add a Pennsylvania Dutch cookbook, I’d take a look at The Art of Pennsylvania Dutch Cooking. 2 nine-inch pastry shells, unbaked. Mix the sugar, butter, and baking soda. Add the remaining ingredients in order, mixing well after each. Add the buttermilk slowly. Pour into the pie shells. Bake for 35 minutes at 375°. If you enjoy cookbooks, you might also be interested in A Concise Encyclopedia of Gastronomy, Bull Cook Historical Recipes, Cavalier Cooking, Classic Chinese Cuisine, Cooking the Bahamian Way, Country Commune Cooking, Life, Loves, and Meat Loaf, The Art of Korean Cooking, The Casserole Cookbook, The Complete Book of Oriental Cooking, The Complete Bread Cookbook, The Frugal Gourmet Celebrates Christmas, The Healthy Cuisine of India, The New Larousse Gastronomique, Saucepans and the Single Girl, The Northwest Cartoon Cookery, Good Food From Mexico, Laurel’s Kitchen, The Cooking of Vienna’s Empire, James Beard’s Fireside Cook Book, French Bistro Cooking, A Fifteenth Century Cookry Boke, Crockery Cookery, Southern Cooking, The Frugal Gourmet Keeps the Feast, The Fannie Farmer Cookbook, French Cooking Simplified With a Food Processor, In Good Taste, Heritage of America Cookbook, Our Favorite Hometown Recipes Vol. II, The Indian Spice Kitchen, Japanese Country Cookbook, La Cuisine Française, Larousse Treasury of Country Cooking, The Natural Foods Cookbook, A Russian Jew Cooks in Peru, Soul Food Cook Book, The Tassajara Trilogy, Pains Spéciaux & Viennoiseries, Whole Earth Cookbook, The Wok: a chinese cook book, Southern Living Cookbook for Two, Lebanese Cuisine, The Art of Syrian Cookery, Popular Greek Recipes, In a Persian Kitchen, and The Southern Living Cookbook Library. “A delectable collection of recipes featuring the wonderful Pennsylvania Dutch cooking and its fascinating history.” A lot of great recipes in here. The Art of Pennsylvania Dutch Cooking last modified November 5th, 2016.